Pressure measurement up to 70MP (10150PSI) with the CA700! 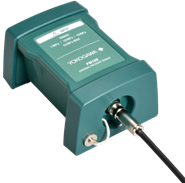 The PM100 is a pressure module which uses the same Yokoagwa dPharp technology as the CA700 and EJA/EJX series pressure transmitters. The unit plugs into the top of the CA700 and extends the pressure range of the CA700 to 70MP (10150PSI), with range switching options to increase resolution at lower pressure ranges. This unit is compatible with CA700's with firmware versions 1.20 or later. With earlier firmware versions, a simple update is needed to be able to communicate with the unit. For calibration of pressure transmitters, accurate measurement of input and output values and calculation of error rate are required. The CA700 ensures reliable calibration with its function to accurately measure input and output values of pressure and current. Additionally its embedded calibration procedures enable users to perform certain calibration following the prescribed procedure. 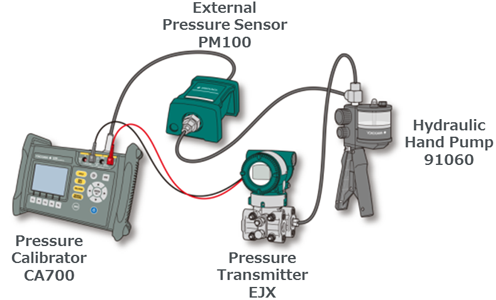 By connecting the external pressure sensor PM100 to the CA700, users can calibrate the pressure in the high pressure range.